Recently, I was asked to automate the process of checking a set of known URLs and determining if each URL corresponded to a “live” site. For our purposes, a site is live if I can PING it and get a reply back. I can open a command prompt and use the PING command and read the response to determine if a site is live. A live site would return a series of messages starting with “Reply from”, while a non-existent site would report an error. Unfortunately it is difficult to automate this task from the command prompt. Fortunately, the .Net framework provides the tools to allow me to ping a URL with just a few lines of code. The functionality I need is in the System.Net.NetworkInformation namespace. at the top of this class. Next, I added the following method to attempt to ping a URL and return true, if successful. That’s it. If an error occurs when I try to ping, it is most likely a PingException, which is equivalent to the "Ping request could not find host" error reported at the command prompt. This function returns true for a URL that exists and is live; and false for one that does not exist. It’s worth pointing out a couple limitations of this function. Some site’s reject all PING request as a way to protect themselves against Denial of Service attacks. 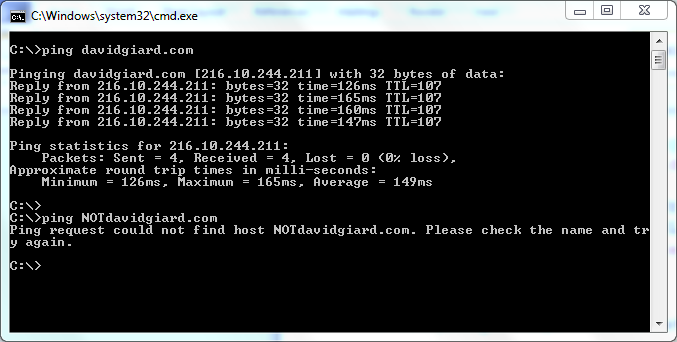 For example, if you PING Microsoft.com, it will not Reply, even though the site does exist. As with any program that uses networking, the internal firewall rules where the program runs may affect the success of the program. The PING command checks for valid URLs, even if the URL returns an error page. So, foo.DavidGiard will reply to a PING request because my hosting provider redirects this to an error page. Even given those limitations, this can be a very useful function for testing if all the Links stored in your database are still relevant. Leon Gersing is a tall, heavy concoction of rubber with a surprising lightness of gait, especially in a dance. He is also a Ruby developer and he loves it. In this interview, he shares why he prefers Ruby over Visual Basic and C# as a language to build his applications. Just because I've resigned myself to the inevitability that I will never know everything about every technology, this does not excuse me from having to know a little about everything. As a consultant, I need to be aware of what is going on in the industry: I need speak intelligently about different products and I often have to make educated choices about available technologies. This is why I'm an avid listener of tech podcast. The recent explosion of available podcasts has helped me stay aware of technology, and to do so in the limited time available to me. Below is a list of the technology podcasts to which I currently subscribe. The list is presented in no particular order, but I recommend each one. If I don’t like a podcast, I've stopped listening to it and it doesn't appear in this list. This is the first podcast that I started listening to and it remains one of my favorites. Carl Franklin and Richard Campbell have been hosting this show for so long that they have access to almost anyone who does anything related to Microsoft development. The quality of their guests is top notch and I never miss an episode. Scot Hanselman is probably my favorite interviewer among tech podcasters. When I do interviews for my show, my goal is to sound as much like Scot as possible. He draws out the guests because he either understands their topic in advance or he quickly grasps it. His humor is understated, which makes for an entertaining show and he has years of real-world experience, making his opinions relevant. I started listening to this show because I knew the hosts - Keith and Woody. I continue to listen because I like the content. This is a show that continually improves itself. It's been a couple months since their last episode, so I don't know if they are still committed to a regular schedule. There are two things I really like about Craig Shoemaker's podcast: The guests tend to be those who don't appear on other podcasts; and Craig keeps the show to a reasonable length. The show always remains fresh for me. This podcast is a little outside my comfort zone because it focuses on networking and other IT topics, rather than on programming and architecture. But Richard Campbell and Greg Hughes work to keep it accessible, so I always learn something. This one is relatively new and I started listening to it right from the start. Mike Neel leads the discussion and does most of the talking. I don’t think they are doing a lot of editing, which means that you always hear the good parts and bad parts of each conversation. I really enjoyed a recent show in which Mike interviewed Brian Prince and Jennifer Marsman. I had just about given up hope on this one. I loved the first 5 episodes that DevExpress evangelists Oliver Sturm and Gary Short put together. They combined interesting interviews with their own witty conversations. Then, after five episodes, SodThis disappeared into limbo. I assumed they had abandoned the project but they released Episode 6 yesterday. I just recently began to listen to The Thirsty Developer. It sound like many of the episodes were recorded in a busy Starbucks, which degrades the sound quality but creates a more relaxed atmosphere for the guests, so the conversation flows freely and enthusiastically. Larry Clarkin is the main guy, but he is sometimes assisted by Dave Bost. They do a good job keeping conversations moving and engaging. Technically I'm still subscribing to this podcast, but I don't know if there are any plans to resume it. I really liked the first few shows I heard, which focused on advanced .Net topics. But they haven't released an episode since April and the last two consisted largely of arguments about whether or not the Alt.Net community is still relevant. Maybe the silence answered that question. I've been listening to Herding Code since its first episode. Originally this was very different from most podcasts because they rarely had guests. Instead, the four hosts exchanged ideas with one another on a preselected topic. This format worked because John Galloway, Scott Koon, K. Scott Allen and Kevin Dente are engaging and articulate enough to keep bringing fresh ideas on each topic. Recently, they have switched to inviting more guests to the show. This is another podcast that seldom relies on guests to interview. Instead, Jeff Atwood and Joel Spolsky chat (or spar) about a variety of topics. Again, this is a format that only works if the hosts are very clever and these two guys definitely are. Because Atwood is still in the process of building the popular StackOverflow web site, much of the conversation revolves around the challenges he faces. So these are the podcasts that I listen to regularly. I can keep up because I have a long commute and I enjoy my IPod at the gym and while doing housework. Having said that, I’d love to hear about high-quality technical podcasts that you can recommend.